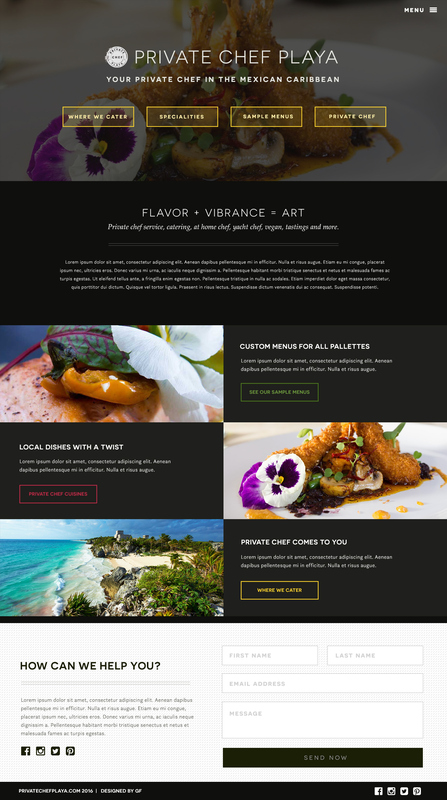 This website was designed for an exclusive private chef that caters to individuals passing through the Mayan Riviera. Her main client was categorized as being from the United States as well as using a mobile device to navigate her website. This is a project redesign from a website we developed for them back in 2013. Overall it needed a responsive refresh. Here is the end result of hard work and determination. Then went on to do the UI elements that would be responsive and touch ready while still maintaining a nice flow in all desktop versions. Main menu drops down smoothly in both desktop and mobile versions of the website, with large buttons focusing on what her clients click and interact with the most. This website was developed to guide the client to the end of the sales process within three clicks. By using images and direct layout, we have seen great results by a large increase in contact requests. By far one of my favorite design projects! This project was such a blast to do, we pretty much had open permission to make decisions as well as propose our idea of what would work. The client was amazing through everything! Hope you liked it! Scroll below to get live site link! Hope you enjoyed, appreciate if you liked!